Summary: These folders contain the correspondence of Governor Allen on a variety of topics. 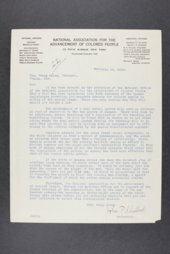 In the first letter Secretary John P. Shillady, of the National Association for the Advancement of Colored People, argues against the segregation of Kansas schools. Other letters relate to issues facing veterans of World War I, such as bonuses, delayed mail, demobilization, discharge records, the release of the 89th Division, and employment for discharged soldiers.